Here’s a selection of crafts that I’ve done in 2009, most of them are on this website. 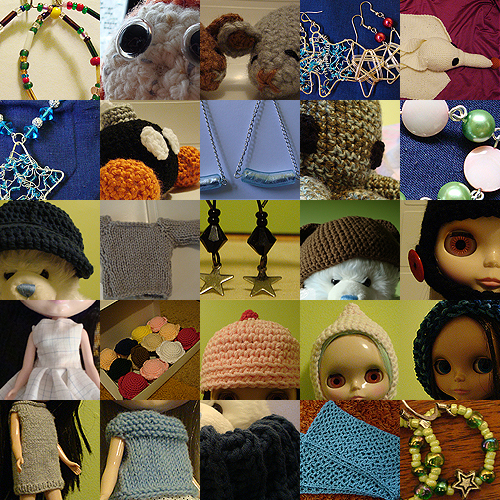 Not pictured are approximately 30 pairs of earrings that I have not gotten around to photographing, maybe ~5 Blythe hats and another sweater, 2 scarves and the hat that I’m currently working on. I wish everyone a happy new year and well wishes for 2010. This is a somewhat delayed post for the pair of earrings that I designed and gifted to a friend for her 20th birthday! It went along with the Crochet Ribbed Cowl and was packaged in one of the new butterfly boxes I got for jewellery packaging (super darling boxes, they’re marketed for wedding favours, but because they came in an assortment of colours and don’t have a specific design, I use them for jewellery packaging). 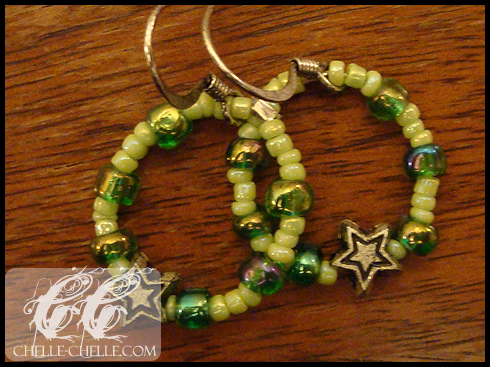 I used a mix of green beads and star charms to go along with the ‘antiqued’ earring hooks (stainless steel that has been chemically treated, they go well with the star charms). They measure about an inch in diameter, if memory serves. Try to use materials from my stashes (beads, yarn or fabric) – A.K.A. spend as little as humanly possible on craft supplies for the year – Exceptions to this would be ‘necessary’ things like: wire (for making jump rings, eye pins, head pins, etc. ), felt (for accents for amigurumis) and spools of thread (for the sewing machine, of course). Utilize the wonderful crochet stitch dictionary that I receieved for my birthday! It’s The Complete Book of Crochet Stitch Designs: 500 Classic and Original Patterns by Linda Schapper and I haven’t gotten a chance to use it as much as I would have liked (used it as a reference so far and used one of the mesh patterns for my mom’s Christmas scarf). I love this book. It’s in need of a review for this site though! Make a light box! I’ve been meaning to since forever. I even have some saved boxes just for the purpose of making a light box, I just haven’t gotten around to making it yet. And, lastly, but definitely not least, to be more organized with all of my craft supplies (I’m going to be cleaning out a few drawers so not all of my beading supplies are, ahem, everywhere – as well as getting a few bins to put my jointly-owned yarn stash somewhere besides in zipped plastic bags in a giant clear plastic garbage bag). The Seafoam Drift Scarf was made for my mom for the holidays. She loves it! 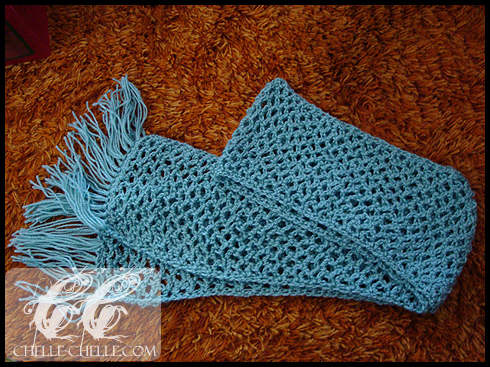 It’s a crocheted scarf in an open mesh pattern with a fringe added on. I’m toying with the idea of posting up the pattern for this. The open mesh pattern is really easy to do and it works up fairly quickly, because of all the open space. It took ~6 hours and it is about 5’5″ long. The entire scarf, the fringe is actually even (it looks a bit uneven in this photo, probably because I didn’t arrange it very well on the carpet). 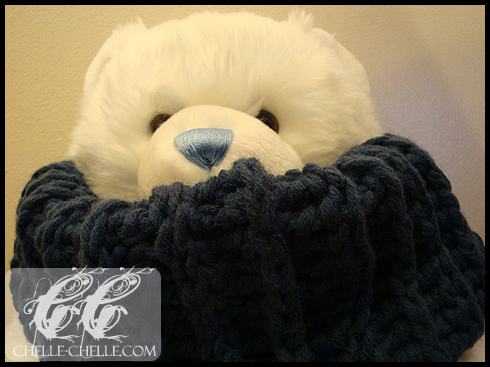 A super cozy cowl made in bulky-weight yarn that is sure to be a quick project! The pattern is crocheted flat so you can stop when you reach the length you need to go around the wearer’s head. 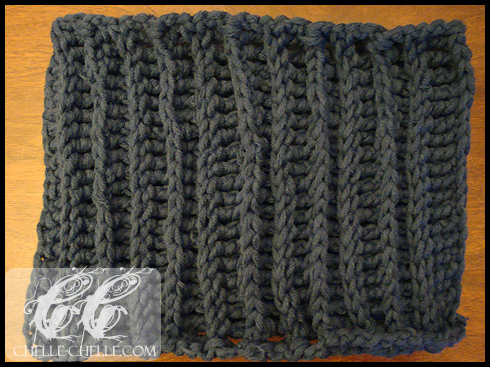 Click to download a PDF copy of the Crochet Ribbed Cowl.